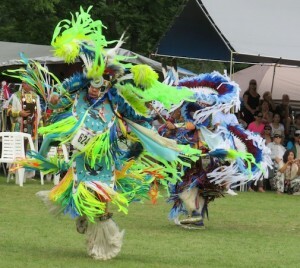 I love a pow wow and the Grand River Champion of Champions Pow Wow is one of the best. 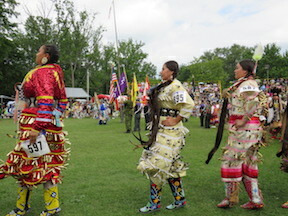 Held the fourth weekend of July outside of Brantford, Ont., at the Chiefswood Tent & Trailer Park on Six Nations land, it’s an amazing celebration of Indigenous culture. 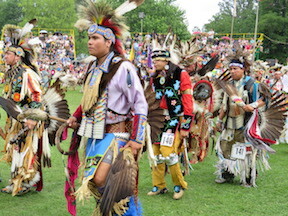 Participants come from all over North America to compete for prize money in dancing and drumming categories. Competitors can place first, second, third or four in a variety of style categories. They collect points for their wins throughout the weekend and on Sunday the dancer with the most points is named the Champion of Champions. The eye-popping colours and different styles I saw were jaw dropping. Dancers invest thousands of dollars and spend years personalizing their regalia (never call it a costume!). Deer hide and moose hide, complicated beading, feathers, and animal skins make each ensemble unique, reflecting clans and First Nation affiliations. 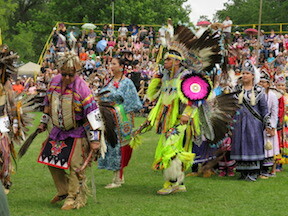 There are six main style of dance done at this pow wow: men’s and women’s traditional dances; men’s and women’s medicine dances (men’s grass and women’s jingle); and men’s fancy feather and women’s fancy shawl dances. The age groupings are golden age (50+), adult, teen, kids and tiny tots. Looking in my program, I found explanations of each dance style. Men’s Traditional is about telling a story, typically of a hunt, battle or certain victory. Crouching, tracking, aiming and running about are common moves. Moving toward the centre of the circle, dancers tap once on the pole or shout out to represent victory over an enemy or success in a hunt. Women’s Traditional features something called scrubbing. 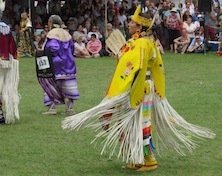 Standing in one place, dancers bounce in time with the drum, snapping the fringes of their regalia. In the walking style, dancers travel around the circle taking small steps and doing deep knee bends. The object is to look smooth, controlled and elegant. Men’s Grass is a medicine dance with fluid, swaying motions representing a sense of balance with nature. 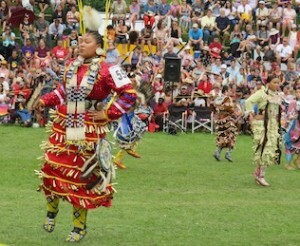 Women’s Jingle is a healing dance of the Anishinabek people of Whitefish Bay. A young girl was ill and one of the men had a dream with the dresses, dances and songs that could make her well. The women followed his instructions, dancing around the girl who by the end had recovered and joined them. 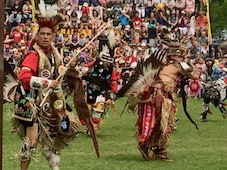 Jingle dancers always keep one foot touching the ground to show the connection with the earth. Men’s Fancy Feather is a spectator favourite with zingy colours and fluffy feather bustles. 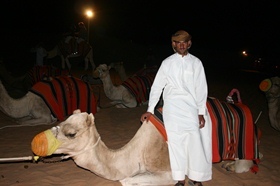 Fast and furious, it is filled with tricky footwork and acrobatic movements. Cartwheels, backflips and the splits are common. 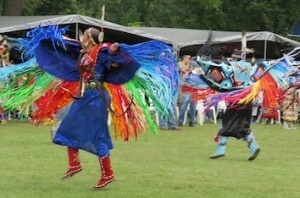 Women’s Fancy Shawl (my favourite) is a more feminine version of the Men’s Fancy Feather dance. Women spin, kick, twirl and leap around the circle. The goal is to look as if they are floating. On Sunday, I watched the Grand Entry, where war vets lead a procession of all the competitors, then settled in under the blazing sun to cheer on the dancers. 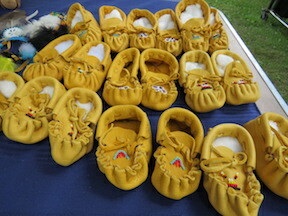 Then it was time to peruse the vendors tents full of moccasins, dreamcatchers, animal hides and so much more. No pow wow is complete without an Indian taco (yes, I know, a politically incorrect name, but that’s what they call it). Fry bread is the base, topped with chili, shredded Cheddar cheese, lettuce, tomatoes, and sour cream. Delicious!